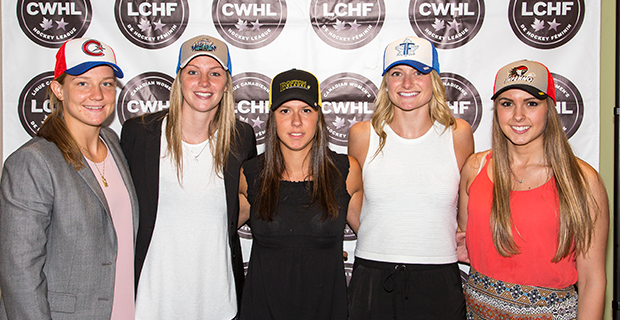 Nine countries were represented at the 2017 CWHL Draft held on Aug. 20 to join the expanded seven team league this upcoming season. The newest draft class represents 65 different U SPORTS and NCAA programs with players from Canada, U.S., China, New Zealand, Turkey among others. The Boston Blades had the first overall selection and chose forward Courtney Turner (Union College, Milton, MA). Also taken in the first round were forward Kristyn Capizzano (Oakville, Ont., Boston College) second overall by the Toronto Furies, defenceman Nicole Kosta (Quinnipiac University, Mississauga, Ont.) third overall by the Markham Thunder, forward Mélodie Daoust (McGill University, Valleyfield, Que.) to Les Canadiennes de Montreal, defenceman Taryn Baumgardt, and fifth overall to the Calgary Inferno. Goalie Noora Raty and left-winger Cayley Mercer capped off the first round with this year’s new Chinese expansion teams. Raty went sixth to the Kunlun Red Star and Mercer was pick seventh by the Vanke Rays. Both the CWHL and National Women’s Hockey League, which is based in the U.S. and pays its players a nominal salary, saw movement this season between the two leagues. Several players from the NWHL jumped over to the CWHL to experience playing in the CWHL and vice-versa. With the two North American national teams (Canada and the U.S.) both having a six-month centralization as they prepare for the Olympics, it leaves gaps on some rosters as players will not return until after the Olympics end. National team players from other countries train for the Olympics sporadically throughout the season, meaning some rosters may be missing players for a week or two at a time while they are training with their home countries. There will be a lot of different faces at the helms of CWHL clubs this season. The Boston Blades announced Jessica Martino, a former defenceman for the Boston College Eagles that appeared in the Frozen Four three times as the general manager. A founding member of the Kunlun Red Star group and director of administration for the Red Star’s men’s team in the Continental Hockey League will oversee the new addition to the CWHL from China — the Vanke Rays. Shirley Hon, who was born and raised in China and spent many years studying and working abroad, steps in as general manager. Kunlun Red Star, the other Chinese team, appointed Chris Vanstone as the general manager. After decades of involvement in the OJHL, most recently as the general manager and president of hockey operations of the Milton Icehawks Junior A hockey club, and years in management and coaching, Vanstone has more than 85 players that have gone to hockey success at many levels including the NHL. Meg Hewings, a former elite-level hockey player for McGill University returns to the 2017 Clarkson Cup champion Les Canadiennes de Montreal. The Toronto Furies will also have a new head coach in Jeff Flanagan. He was an assistant coach with Team Canada East at the World Junior A Challenge and been involved in a number of roles in women’s and men’s hockey at the University of Guelph.